Envelope Generator wrote: What terrible service. Fortunately the customer is free to switch to another space supplier. So If I understand correctly, you don't want to be with the space supplier with the best flight record? Help me understand why you don't want NASA. Is it supposed to come pre-loaded with Cortana instead? Silicon atoms create very simple crystals. Industrially processed silicon for CPU usage comes in incredibly pure boules. Besides actual semiconductor dies, laptop components easily reduce to grit, simply blend until desired texture. Am I the only one concerned that Crash & Burn have been in that pool for almost twenty years now? I spent 30 minutes on thursday installing updates, which involved three reboots and broke my flow. ...And I still havent finished my original thursday workload! CrispyCrew wrote: 2. What is the word in English for the little splash made by a drop of rain when it lands in a puddle? Primis wrote: Been gone since page 15, what have I missed? Not much, to be fair. Been gone since page 15, what have I missed? Aww you beat me! I admit defeat. So my server crashed this morning at 5am due to traffic, it was down until 11. I fixed the GIF so the missing frames are in. Within five minutes of the Singularity appearing, somebody will suggest defragging it. 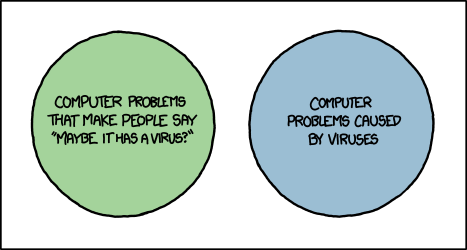 Personally, I've never been able to prove this, I've never had a known virus. lassehp wrote: I'm quite posixtive they are not portable. Yeah... That's only 16 years.